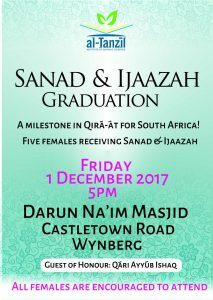 A first for South Africa: all are welcome to witness the first females-only completion ceremony of a group of females who will be completing various Qirāʾāt, under a female teacher. Muʿallimah Ayesha bint Ganief Abrahams is the only female in South Africa to have attained sanad and ijāzah in the 14 Qirāʾāt; the Ten canonical Quranic Readings as well as the Four extra canonical Readings. She is the only female – full-time teacher – committed to passing on this sacred knowledge to her students. On Friday the 1st of December 2017, five ḥāfiṭḥāt will be completing their khatms and become part of a sanad, or chain of transmission linking all the way up to Prophet Muḥammad (pbuh), who received it from the Archangel Jibrīl, who in turn received it from Allah Himself. Ibn al-Jazarī records this as being of the greatest honours and achievements in this world; to be linked to the Messenger of Allah through the Kalām (Divine Speech) of Allah. Furthermore, the last five links in the chain of transmission will be present at this momentous occasion: the students, Muʿallimah Ayesha bint Ganief Abrahams, her first teacher: Moulana Abduragmaan Davids, his teacher: Qārī Saleem Gaibie, and his teacher: Qārī Ayyub Essack, who will be flying in from Johannesburg for the event. Moreover, the students will receive sanad and ijāzāt from their teacher, which means that they will be issued written authorisation to transmit the Glorious Quran on behalf of their teacher. These written ijāzāt record the oral tranmission of the Quran from their teacher and transcends 14 centuries of illustrious Quranic scholars until it reaches the Prophet Muhammad (pbuh) himself. This is a historic occasion, and a milestone in the field of Qirāʾāt for South Africa. It is a pioneering event and we pray that it is the first of many more. We pray for the continuous success of Muʿallimah Ayesha Abrahams, her teachers and her students. May this be an inspiration to our community – especially females – to invest in the tradition of attaining sanad and ijāzah in the transmission of the Divine Speech, and not only end with the memorisation of the Quran alone. And may those who have attained sanad, aspire to connect themselves to the Prophet Muḥammad (pbuh) through all Ten canonical Readings and 20 transmissions; the closest to the Prophet (pbuh) being the Reading of ʿĀṣim via the transmission of Ḥafs and the Reading of Ibn ʿĀmir al-Shāmī via the transmission of Ibn Dhakwān. Ml. Radia Bawa, Ml. Kareema Jassiem, Ml. Fuzlin Girie, Ml. Aneesa Jabaar and Ml. Wasfeeya Altalib will be completing various Qirāʾāt, beginning at 5:00 pm on Friday the 1st of December 2017 at Darun-Na’im Masjid, 65 Castletown Road, Wynberg, InShaAllah.